Just over 50% of our vehicles are LTC TX taxis. 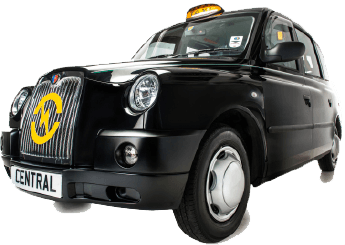 The TX is commonly referred to as a “London Hackney Cab”. It is wheelchair accessible and has capacity for up to 5 passengers. It’s traditional style is popular with tourists and visitors to Edinburgh. Mercedes taxis are larger wheelchair accessible passenger vehicles with space for up to 6 passengers and increased luggage capacity. Mercedes M8, Vito and Viano taxis make up approximately 30% of our entire fleet. Our wheelchair accessible Peugeot E7 vehicles can seat up to 6 passengers with capacity for luggage. This type of vehicle makes up just under 20% of our entire fleet. 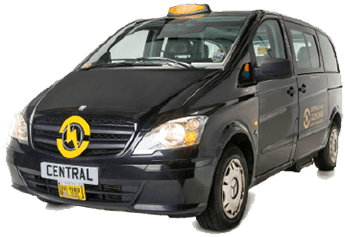 All Central Taxis are fitted with a security partition giving privacy and an additional element of safety to both the driver and passenger. 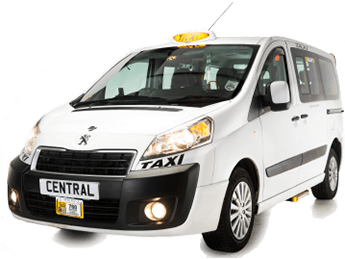 Over 80% of Central Taxis’ vehicles are less than five years old, making our service more reliable as the vehicles are less exposed to risk of breakdown. Each vehicle in our fleet has uniform signage. Identifying yellow call-sign numbers are affixed to front and rear windscreens. These are preceded by a ‘P’ and 2-3 digit call-sign, alongside the company logo.